Das charmante drei Schlafzimmer, zwei Badezimmer sitzt angefertigten Holzrahmenhaus auf einem Acker und ist nur zehn Meilen von der West-Eingang zum Glacier National Park. Mit drei Schlafzimmern und einem großen Schlafsofa, wird es bequem schlafen 7 Personen. Die Küche ist komplett mit Geräten aus rostfreiem Stahl mit einer Mikrowelle. Es gibt eine Waschmaschine und Trockner für Ihre Bequemlichkeit und das Haus ist mit WiFi-Internetzugang und Kabelfernsehen ausgestattet. Das Achterdeck bietet eine friedliche Szene in den Wald, der mit einem Grill findest, die Du BBQ. Die Master Suite ist bis seine eigene Reihe von Treppen über ein Queen-Size-Bett, hand gefliestes Badezimmer, Kabel-TV, ein eigenes oberen Ebene Deck, und viel Platz zum Erholen und Entspannen und umfasst. Die zweite und dritte Schlafzimmer sind an der Spitze der Open-Air-handgemachte hölzerne Wendeltreppe mit voller und zwei Einzelbetten jeweils direkt in die Mauern errichtet wurde. Zusätzlich gibt es eine beruhigende Meditationsdachboden unter den Oberlichtern, die von der Spitze des einen in Leiter gebaut off der zweiten Etage zu erreichen ist. Es gibt einen Fernseher und DVD-Player im Wohnzimmer zusammen mit einem Holzofen, ideal für Eisstockschießen bis auf die kalten Nächte Montana. Das Haus verfügt über ein eigenes acht-Personen-Whirlpool und eine Feuerstelle mit einem gut sortierten Angebot an Holz und liegt nur einen Block von der mittleren Gabel des Flathead River. Das Haus liegt 15 km vom westlichen Eingang des Glacier National Park und nur 14 km vom internationalen Flughafen Glacier in Kalispell entfernt. Mit einfachem Zugang zu Autobahn 2, ist diese one-of-a-Kind Holzrahmen Haus ideal für einen Sommerurlaub zu Glacier National Park oder Whitefish Mountain Resort, und in der Nähe zu vielen anderen Attraktionen rund um das Flathead Valley of Montana. Zwei Badezimmer im Haus, ein auf der Hauptebene und eine im Schlafzimmer. Simply a fantastic little get away from the everyday. A house with more window shapes than most homes have windows. Great for Hide and Seek with kids, building snow forts in the yard, relaxing in the hot tub or working some muscles cutting up firewood for the wood burning stove. Hot water tank for the “master suite” could use some fine tuning as it does not get overly warm, but overall this is a fantastic little place that is rustic and charming. The deer that seem to love the food being served in the back yard ( trees and shrubs) are a wonderful little added touch of being close to nature. 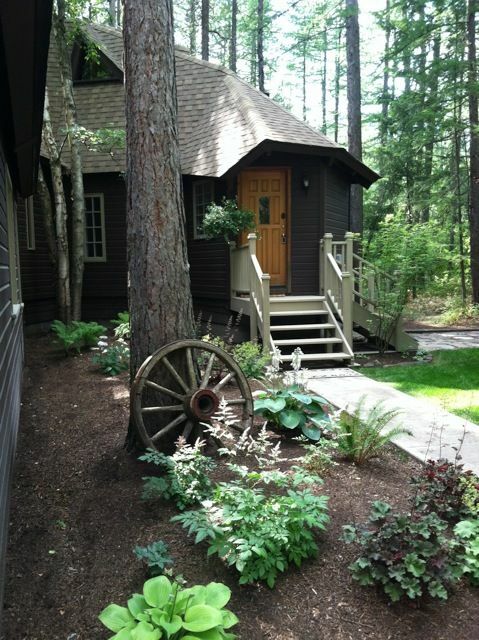 We enjoyed our stay at this lovely cabin so much it was hard to leave! The cabin has lots of character and an incredibly cozy feeling to it. We felt the stress and busyness of life melt away while relaxing by the wood stove. It is a very private, green and amazingly clean vacation home (We were really really impressed by the cleanliness!). Holy & Adam were friendly, prompt in their response time and super helpful and informative. We can't wait to visit this gem again! Lovely, quite place to escape urban reality. Our stay at the Unique Retreat was nothing short of perfect! From the wood stove in the living room to the AMAZING hot tub on the back deck, we couldn’t have asked for more. Quiet and secluded but still close to the park, groceries, gas, etc. Highly recommend for anyone interested and we are already trying to plan another trip back. We arrived after dark, from the north and the directions were for travel coming from the south and unfortunately heat was an issue upon our arrival, no wood by the stove, paper but no real kindling. Heat controls were in unusual places and after texting found the wood pile, so chopped wood for the fire that was great, but would have been nice to have a fire ready to go and maybe the outside light on. The bed in the master suite was horrible, a tunnel in the center, making us roll to the center. Lots of stairs in all parts of the house, so if you have any mobility limitations this is not the place for you. Close proximity to the Park was great and Hungry Horse proved to be a friendly helpful community. This was clearly not the best house for this group of elderly folks to choose. They should have done their homework before booking. The stairs in each portion of the house are clearly visible in all of the photographs, and stairs are mentioned in the description of the house. The bed was replaced the same day that they brought it to my attention (after their stay), October 25, 2018. I have changed the directions in my "key code email" to make it easier for everyone. Check in is at 4:00 pm, during daylight hours.... There is a woodshed full of dry wood, approx. 15' from the front door. I firmly believe that if you can't chop your own kindling/firewood, or are not familiar with an ax/maul, you should not be using the wood stove. There is electric heat in the entire house, and it was set at 65 degrees when this party arrived. We enjoyed our stay here. Loved the layout, landscape, privacy, comfy bed and hottub was a perfect plus after long days of hiking and sightseeing. This location close to Glacier NP was great. You won't be disappointed if you stay here. Hope to come back again. Hungry Horse ist eine kleine Gemeinde neben dem Westeingang des Glacier National Park. Hungry Horse bietet eine Handvoll Restaurants, zwei Convenience-Stores, ein Lebensmittelgeschäft, ein Postamt, einen Waschsalon, eine Bar und einen Spirituosenladen. Wir haben auch ein paar tolle Souvenirläden. Hungry Horse befindet sich direkt in den Bergen auf dem Weg zum Glacier, wo sich die Südgabelung des Flathead River an die Mittelgabel anschließt. 25% of the rental fee is required as a down payment to hold the reservation. The remaining balance plus the 7% lodging tax is due two weeks prior to check-in date. After final payment is received, key box code and directions will be provided via email. Credit card information will be held for 48 hours after check-out date to cover any damages. Client will be notified of damage costs prior to charge. A rental agreement will be emailed to you upon payment of the deposit. If you choose to use online booking, you will be required to provide a credit card number directly to homeowner, in the case of damage to the property. CANCELLATION POLICY: If you need to cancel your reservation more than 30 days from the check-in date, you will receive your entire 25% deposit back. If you cancel 15-30 days from check-in date, you will receive 1/2 of your deposit back. If you cancel your reservation within two weeks of check-in, you do not receive your deposit back. There are no additional fees.